Wait! how could that be? answering the phone with a dial-up connection??!! unheard of…. Well, the day has finally come and I’ve joined the ranks of high speed internet users once again. Ahhhh…this feels good. Things are continuing to come together around here. It feels like I’m getting my birthday presents a few days early–cable internet, a few "lifeline" channels on the TV, and today we traded in the chronically broken car for a new (used) one. And to top it off, my little sewing machine is oiled and adjusted and ready to come home from her little spa visit to the shop. I hope she’s relaxed, rested and ready to get back to work! 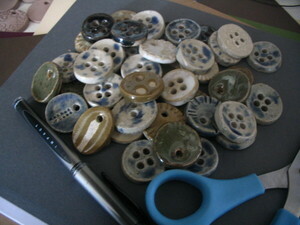 For WIP friday–a stack of buttons and small pendants waiting to be sorted and put on cards for my etsy shop very soon. 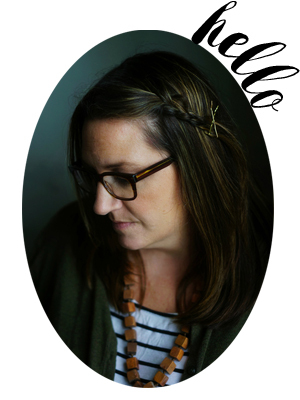 If you’re on my mailing list, I’ll give you the heads up first. I’ve been forced to do some hand crafting since my sewing machine has been in the shop, and I’ve been meaning to do some of Emma’s drawings that I tuck away, for quite some time. This is one of my favorites of hers. When I was working on this, she said to me, "you know mom, I can draw you some more birds if you want." She must be picking up on my obsession with this little sketch. After I worked on it, I wished I had enlarged the drawing a bit and used a few less strands of floss, but the feel is still definitely still there. She’s been asking me to make her a pillow for her bed, so I think this will be on there somewhere. We just refreshed our stash of library books this week. ( I can’t believe the new group is due on July 31st! This summer is going by so quickly!) Anyway, our latest "study" with the girls is birds. 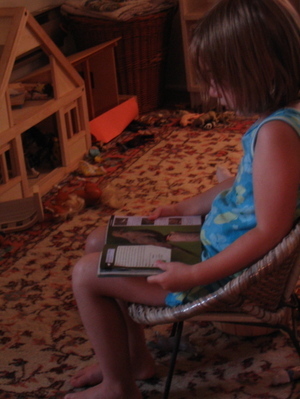 Emma seems to have her field guide by her side at all times. She does the best impression of a mourning dove–well enough that one outside our door "talks" back to her. We have some great books, that I’ll post in the sidebar this weekend. One I especially love is about how different birds build their nests. It really is amazing what birds can build using natural materials and their ingenuity. I think we might give it a try ourselves and see if we can build anything close. Next week, I’ll have some amazing mail to share, I’m planning another trip to the ribbon outlet (wednesday? mom? mary? ), and I’m hoping to give a few things away…stay tuned….Happy Weekend! oh that pile of buttons looks so good! welcome to high speed baby! i bet you uploaded these pictures in a snap! oh ribbon outlet…makes my heart faint to think about it. take pictures again so we can drool! Your embroidery looks great. It’d be very interesting to see what it looks like a bit bigger. 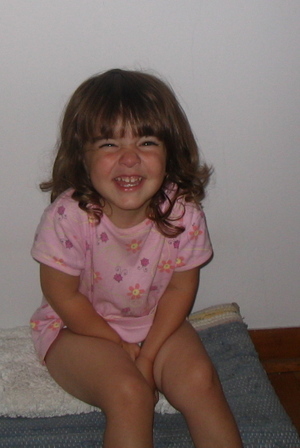 And how amazing is it, not only to find a secret photo in your camera but one with such a cute smiling face! Woohoo on broadband internet! Well done. Love the embroidery – what a fabulous idea. Whoops. THat reminds me. Romily’s books are way overdue. We’re off to the library today! I’ve only had high speed myself about 2 months, gotta love it! Can’t wait to see the cards you’re making. Congratulations on the new Internet connection! It really makes you wonder how you suffered through for so long in the first place! Love your buttons. I can’t wait for them to go up in the shop. Or maybe you would be up for a trade of some kind? Oh, and guess what! I just embroidered several of my kids’ designs on our vacation. A canvas bag and pillow. I have some more I’ve started that I will probably make into pillows. My couch is in desperate need of a redo! I’ve been doing a lot of blog stalking, mostly becuase I’m lazy and hot, but I’ve been reading. 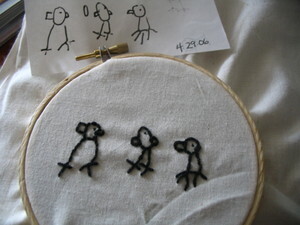 Your emboridery project is too cute! I love children’s drawings translated into crafts. it’s such a great keepsake. That is such a sweet embroidery. Gorgeous little birds.